We offer several different styles and colors of Reborn Doll Eyelashes, Preemie Lashes, Newborn Lashes, Human Hair Eyelashes, Sophia Lashes, Wispy Eyelashes, Top and Bottom Lashes, 8" strip of lashes and several different tools to help with Eyelashes. These eyelashes may be trimmed to size. Great for your Reborn Baby. Special Purchase - Choose Brown or Black. High Quality Wispy Eyelashes, One Pair. Both Top and Bottom in one Set. Easily insert eyelashes on your Reborn Baby. This helps to hold the lash in place, making the eyelashes look more natural then ever! Steel Tweezer for tiny fine detail work. Fine Tip, Great for lashes. 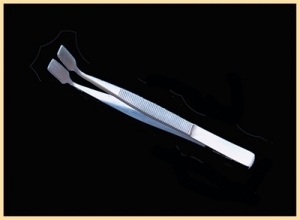 Tweezer Scissors - Great for making your own special skin texture sponge from cosmetic sponges. making the eyelashes look more natural then ever!